When family gets a little bit bigger and merrier (that’s optional). When there are already new masters in the house except her majesty the Queen. Those new masters of your home universe are the adorable little Prince and Princess. And since they still want to be as cool as mommy and daddy you have got to equip the whole family with our new set of products. So there is one for the King, one for the Queen, one for the little Prince and of course one for the little Princess. And let’s be serious for a while- matching family t-shirts bring smiles to the faces and create a warm feeling that family actually is the most important thing! So here they are: they come in different size, variety of colors and optional number on the back. Everyone gets what he wants! 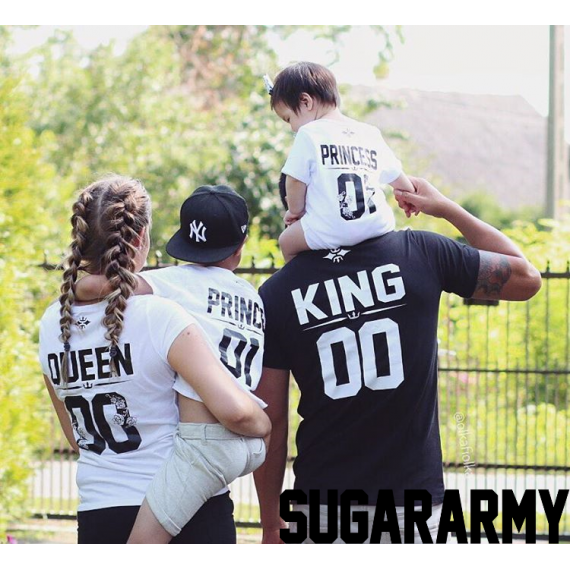 Our matching t-shirt sets are accessible in different combinations: King and Queen t-shirts + Princess body suit and Prince t-shirt and King and Queen t-shirts + Princess t-shirt suit and Prince body suit.